The System 12 underwater magnetic particle inspection unit has been developed as the ideal diver operated underwater MPI system for shallow water/tidal water use. 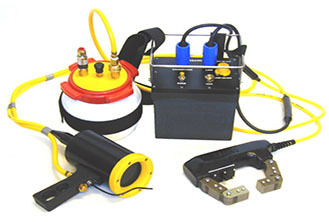 Discussions with inspection diving contractors revealed a requirement for a fully portable underwater MPI unit capable of being used by divers in shallow water or tidal conditions. Ideally, the unit should NOT require any form of umbuilical connection to the surface and should be capable of sustaining the inspection operation for up to 4 hours duration. The result of this development is an inspection system powered from a 12 volt rechargable battery unit and compirising battery/control unit, DC electromagnetic yoke and a high intensity UV light incorporationg an arc discharge bulb for high ultraviolet content in the light produced. Magnetic ink can be supplied by attaching the optional ink dispensing unit or even from the surface. View our Subsea MPI Inks and Accessories here.